The C3/T3 break-bulk cargo ship/tanker was the mainstay of ocean shipping for decades, supplanted by container ships in the years around 1970. Shown here is the prototype model on my layout in Albuquerque. The C3/T3 hull is the basis for the 487′ First Generation Container Ship, with a different stern and the machine spaces moved to the stern. The Beavercove has a raised cruiser stern. The middle island could accommodate 20 passengers in relative luxury, at about 20 knots per crossing. Alternate midships islands will be available, as well as poop deck houses, and the decking and details for tanker hulls. Cargo details include the many winches, posts, booms, and rigging used by stevedores to offload cargo; the decks are detailed with the many ventilators, lifeboats, davits, hose reels, and myriad other equipment on these utilitarian and sometimes handsome ships. The model replicates the sweep and camber of the hull and superstructure, making it a graceful but somewhat difficult to build kit. The bow and stern are large cast resin pieces, joined by a styrene box section, so the hull is easier to fabricate. The camber of the middle house will be a challenge, as it is best built up on the hull, making painting a task that requires some planning. 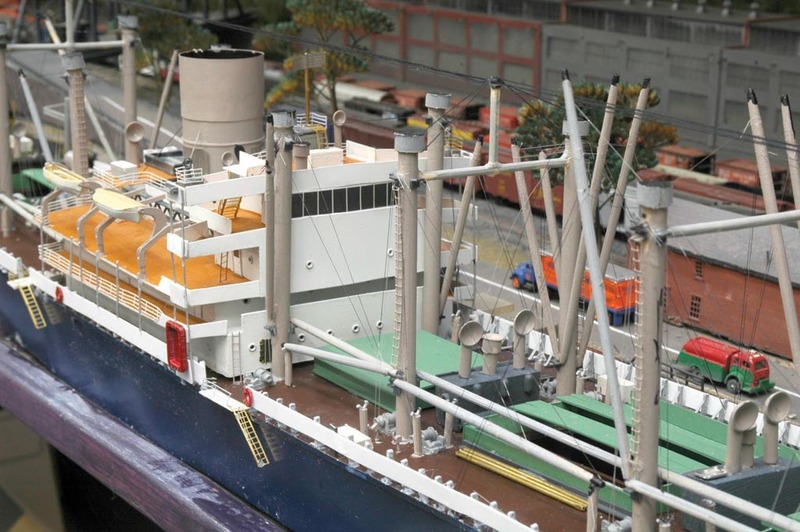 The solid white bulwarks along the forward and rear decks will be replaced by prototypical brass railings, which were not available at the time of this build. Here’s a closer view of the details built with this model. Due to the immense amount of brass and white metal castings, prices for a fully detailed kit will probably be about $600, although I am working very hard on less expensive fittings. I will probably offer a basic kit, for those who want to build or supply their own details, at around $300. Prices for a fully detailed built-up will be in the $2500 to $4000 range. This model will not be part of my regular line, but is available on custom order. It will be about June before kits will be available, but inquire, as hulls and superstructures are available.